Our personalized golf photo blanket is an excellent way to capture your favorite summer golf memory. The Memories Place, a company specializing in top-quality, custom gifts, has announced the addition of golf photo blankets to its line. 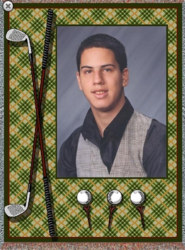 The golf photo blankets feature a photo of the customer’s choice, bordered by a plaid design complete with images of golf clubs, balls and tees. This product is available in a 54" x 70" woven throw, and optional text may also be added at no extra cost. The Memories Place works only with the finest manufacturers and is dedicated to delivering the best quality products and outstanding customer service. The company strives to ensure that each and every customer is completely satisfied with the experience, from the selection and ordering of customized gifts to shipping and follow up. The company offers a wide selection of woven, fleece and knitted photo blankets and photo throws, as well as canvas prints, photo pillows and totes. All orders over $75.00 with The Memories Place are delivered free to the Continental United States. As part of its commitment to customer satisfaction, the company offers a 100 percent guarantee and will refund the full purchase price to buyers who are not completely satisfied with their final product. To browse the company’s selection of photo throws, glassware and other customized gifts, visit http://www.thememoriesplace.com.